The Octagon SX88+ Optima Combo is a satellite, cable and terrestrial receiver, IPTV & media player in one and offers numerous entertainment features for a wide and diverse range of entertainment. You can complement your DVB-S / S2 or DVB-C / T2 TV program with the Octagon SX88+ Optima Combo receiver via the popular Kodi media player and Stalker support through additional content sources. The Linux operating system installed ex works on the combo receiver can also be freely adapted and customized thanks to a variety of add-ons, skins and plugins. This combination and the other common and current features such as multi-stream and blindscan support, DLNA Media Player Support, Unicable and DiSEqC capability, EPG u.v.m. make the Octagon SX88+ Optima Combo a great choice when it comes to entertainment and receiving your TV program via satellite, cable or DVB-T, which also scores with a variety of connectivity options. 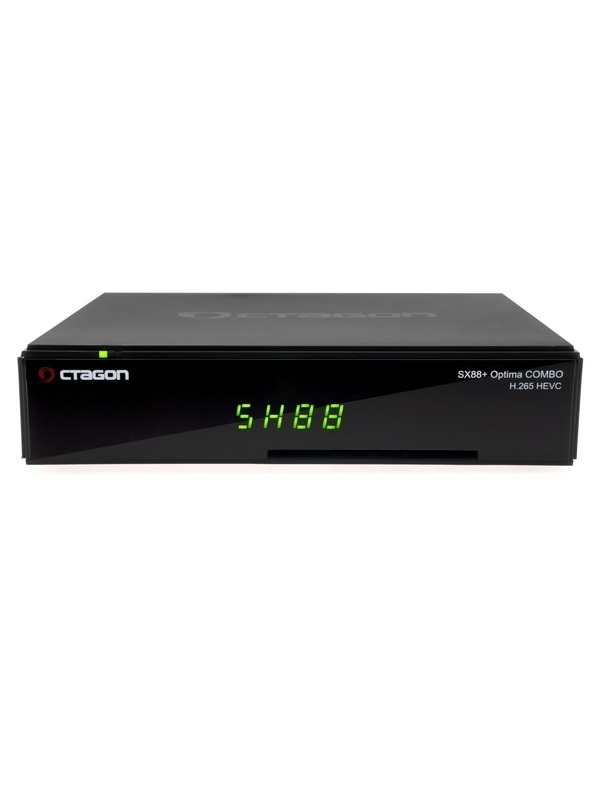 To receive your TV program via satellite, cable or DVB-T, the Octagon SX88+ Optima Combo has a DVB-S / S2 LNB input as well as a DVB-C / T2 input and a Conax card reader. The two side-mounted USB 2.0 ports can on the one hand entertainment content from external storage media such. Play USB sticks and save recorded contents (optional). Further contents of the Octagon Sat receiver SX88 + Optima Combo are an RS-232 interface, an HDMI output, a composite AV jack connection, an Ethernet LAN connection and an S / PDIF output. Thanks to the connection for the included, external IR receiver, the Octagon SX88 + Combo can also be perfectly installed in niches or hidden in the TV rack, making it a camping- and travel-ready receiver.